Welcome to the jungle of yet another year of political mine fields. No matter which side of the isle you happen to be on, everyone has an opinion on education funding and what we should (or should not) be paying teachers. My own state of Minnesota is debating whether or not the time is right for a hard pay freeze. It's pretty obvious who falls on which side of the debate - Republicans for the most part want to bring the deficit down by cutting taxes, which therefore means less money for schools, so teachers in their opinion should shoulder some of the burden of reduced wages. While Democrats, on the flip side, want to increase taxes on the wealthy to help shoulder some of the tax burden that would pay for needed services and education costs. We can all argue until we're blue in the face about whether or not taxing the rich to increase services, or cutting taxes to stimulate growth, is better for the nation, but there are some realities in education that simply cannot be overlooked anymore. I am offering a teacher's perspective of what it feels like financially to BE a teacher, instead of what people are hearing from politicians and their often erroneous statements. After you've looked at the data for yourself, we'll see how many people feel that teacher pay has really "risen", while the rest of the market is in a recession. And for those nay-Sayers out there who still think that Minnesota pay is ahead of the curve, check out the NATIONAL pay averages here. Even on a national average, which is better than more than half of the states out there, "The salaries of public school teachers have generally maintained pace with inflation since 1990–91." Average insurance cost data is from an 8-page Whitehouse report published in 2009 and more recent publications. I used a 40% contribution rate which is actually lower than what I contribute, but still much higher than the contributions of non-teaching professions that run closer to a 25% employee/75% employer distribution. As a math teacher, I'm pretty good at Excel formulas. I took the published average salaries, reduced them by the factor of inflation that applied for the given year, and then subtracted the 40% of typical health care contributions that employees are expected to pay. Even before these calculations, you can look at the bottom row of totals in yellow, gray and red. Notice that while teacher salaries may appear to have increased by 17% from 2003 to the present, inflation has grown by 22% and health care increases have ballooned to 68%. So while it may appear that teachers have "continued making more money each year", what it really equates to is a whopping net increase of $2972 over 8 years, or $370 per year. Take into account how much additional training the "average" teacher has obtained during those 8 years; either returning to college for a masters, seeking outside training from the school day, or just plain spending money on their classrooms (which we all do) and that increase is wiped out in the blink of an eye. Also keep in mind that this doesn't include the additional dental insurance, union dues, and mandatory TRA contributions that we pay. Lucky us! Those are tax-deductible. And don't even get me started on "not working summers". I don't know a single teacher who doesn't either teach summer school, attend committee meetings (sometimes paid), check emails, stop in to clean out the classroom, in addition to the hundreds of unpaid hours we spend correcting papers and updating our websites. What other profession has such a high out-of-the-work-day expectation of its employees? This graph is a visual representation of the actual and adjusted columns from the table above. Isn't it shocking how different they look? Even back in the 1990's when the economy was booming, education was still putzing along with average increases of $500-$1000 per year, which is the same as it is today. Except for sky-rocketing medical costs. So the majority of teachers and other state employees continue to make less and less money each year, even IF we are lucky enough to get a union-negotiated raise. 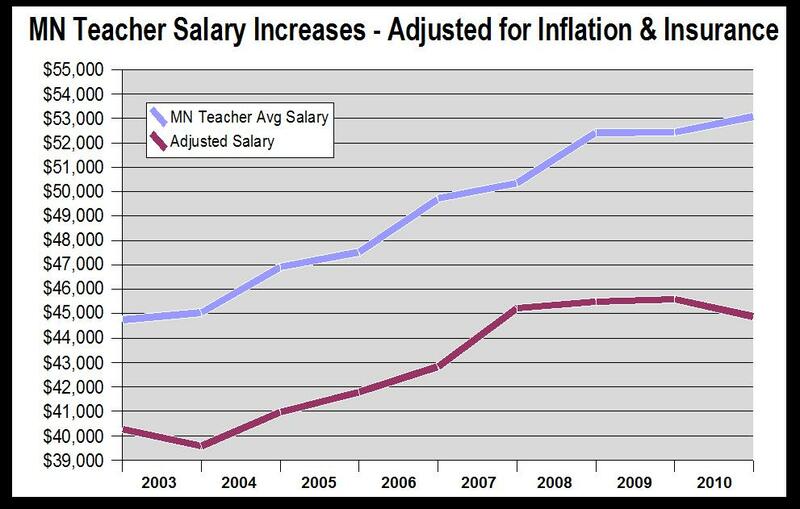 So MN legislature... bring on the "hard freeze"... like a pay reduction is something new to teachers!?!? It's just an extension of the school distribution "deferments" that will never be repaid. And the state funding cuts to schools, with the expectation that local government levies will pick up the slack. You're not fooling anyone, politicians, with your "saving teacher jobs" line. Whose fault is it that the state is out of money!? It's YOUR FAULT!!! Because you spend all our tax-dollars on your high-horses pushing party-driven agendas that the other side will NEVER AGREE TO, instead of looking at realistic compromises using rational logic and remembering the original intent of taxation and common good that our country was founded upon. This video says it all. In conclusion: I am a trained professional with 5 years experience, two bachelors degrees and a masters degree. I don't buy new clothes. My boys wear hand-me-downs whenever possible. When the batteries in their toys die, they rarely get replaced. We don't take expensive vacations (or hardly any vacations). I drive a 2000 two-door Alero coupe. I pay family rates for medical and dental insurance. AND my family is HEALTHY. I have a small, but annoying monthly college payment that will require another 14 years to pay off, at the rate I'm going. And another not-so-small amount of revolving credit card debt. I've written a book that makes a pittance. I sell teacher materials on and off-line. I do freelance book reviewing and sell an occasional item on eBay. I have occasional garage sales and also attend them. I shop at Walmart because I can't afford Target's prices. We have very generous parents and in-laws. And we still *barely* make ends meet each month. 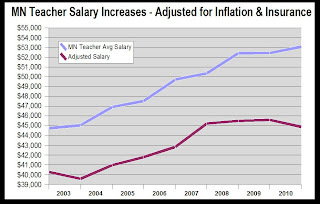 Teacher salaries are just like any other profession: it's a matter of supply and demand. If I left my job today, there are 40 other teachers who could do my job as well as or better than I can (and I am consistently told by parents, students, and administrators that I am a highly effective teacher). Let's not kid ourselves - there are often hundreds, if not thousands, of people who can do any job better than the person currently doing it (even Tiger Woods now knows there are people out there better at golf than he is). If you want to earn a higher salary, you need to go into a profession that commands a higher salary. The market (or politicians, for that matter) won't raise our salaries just because we will them to; until teachers are willing to have their contributions valued in dollar terms (which can be done), we won't see our salaries increase beyond COLA. Accurate and valid points on all accounts. My concern is more about the fact that during economic booms, teachers are usually given only marginal increases. Rarely proportional to the increase in either effort or economic wealth. Often that increase is given after long months of negotiation (usually amounting to a 4-6 month pay freeze every two years while we wait for negotiations to conclude). The back pay in and of itself is often nice, but too often steps and lanes are tied to it, which loses even more ground than other professions year upon year. It's when the economy takes a turn for the worse, that teachers are all of a sudden painted as the money-driven bad guy again. Like any teacher is "in it for the money". Herein lies the greatest hypocrisy... teachers are expected to "shoulder the burden like everyone else" during a recession, taking huge pay cuts, freezes or the tiniest of margins of supposed "increases". The government wants to step in and PROHIBIT teacher unions from attempting to negotiate even a cost of living raise, and to take away our rights to strike. But when the tides turn, and the market rebounds, where are the politicians then? Are they stepping in again? To FORCE districts to give teachers better pay because the economy is better? No. "That's up to each district school board's discretion".